Unicorn Store is the type of film I honestly hate to critique. It’s intensely personal to the first time director (she uses real home video footage early on), is as raw as a dirty scrape from falling on gravel during the learning to ride a bike phase, and there are a few genuine glimpses of true inspiration early on. However, having said that, the picture and its memorial message to the staying power of imagination also suffers from being born with an enlarged heart that’s nestled inside too small a body. Some movies don’t have a pulse at all, landing dead on arrival. Unicorn Store’s biggest issue is an inverse problem. It beats too fast, with a distinctly irregular pattern, to sustain its dramatic approach to a story written with enough whimsy to the point of appearing glitter bombed. The subject of this self-portrait is Kit (Brie Larson), a flunked art student forced to move back in with parents Gladys (Joan Cusack) and Gene (Bradley Whitford), two nice and supportive people who help mentor troubled youth. With her presumed life calling cut short by teachers who refused to accept Kit’s preference to color outside the lines and to push the boundaries, she devolves into a couch potato, alive but intent on refusing to really live. Kit’s reintroduced to an old friend named Kevin (Karan Soni), a nerdy guy with no college degree but enough can-do action to make her ditch the Peter Pan dreams for a business casual outfit at a temp agency. Some there like her creativity, others object it, and she gets an elaborate invitation to “The Store,” a place with “The Salesman” (Samuel L. Jackson) promising the power to sell “what you need.” Kit doesn’t just want a real unicorn…she needs one. Along the way Kit meets Virgil (Maoudou Athie), the soft-spoken man working at the hardware store. They spring an odd fling. She spirals and descends into childlike madness, or so her parents assume. These aren’t frivolous fascinations though; Kit’s dream has the possibility to become real so long as she takes the time to build towards it and to be constructive in the process. Most of the plot tries to support the film’s exploration of the abstract and how such art can register understandable emotions. And I believe that’s possible. I remember being washed over with a similar wave the first time I saw a Picasso in grade school. 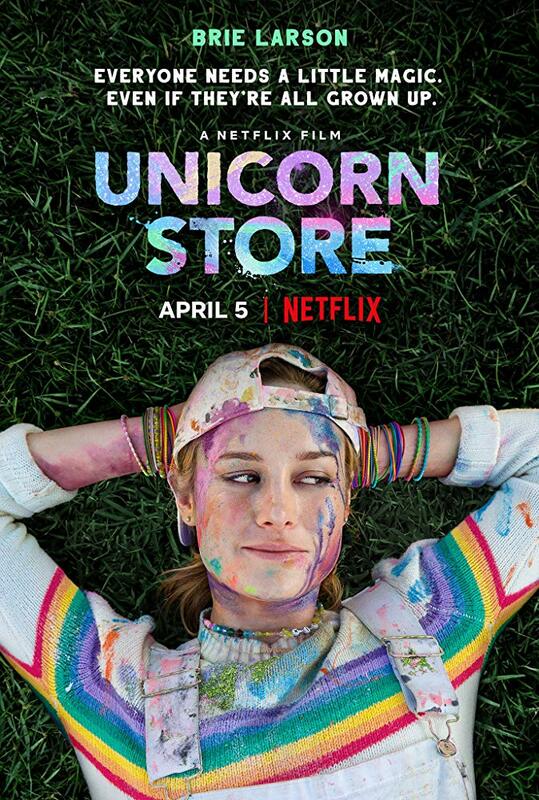 Picasso’s cubism is intricate and specifically boundless, whereas Unicorn Store merely settles for telling us that it is different and explaining away why we all should appreciate its abstractness, defying the fundamental aspects of a form which exists outside of the laws of nature. I’m not sure if many people remember the old, viral series of online animations called Charlie the Unicorn. In the first video two colorful unicorns goad a presumably older and gray unicorn named Charlie into an adventure to “Candy Mountain.” They hop on him, sing songs, shun him for not being a believer. And after entering the magical place, Charlie wakes up only to discover that he was duped and has had a kidney stolen. Unicorn Store made me commiserate with Charlie. It’s earnest and empathetic and somehow a total misfire all at once. Brie Larson shows she can competently direct a film – although her recent performances have become too self-aware and less nuanced ever since her big Oscar win – and I believe she can be a powerful voice in the independent realm moving forward should she choose to write a script from her own heart. Again, Unicorn Store admirably aspires to inspire ageless wonder, but if you want to throw on a better film with the exact same message, I might suggest 2017’s Brigsby Bear. Probably a few others over this one, too.